We’ve talked before about The Shiny Object Syndrome (SOS). 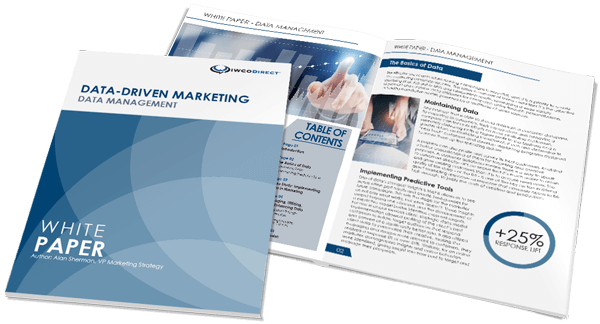 In SOS, marketers are drawn to emerging marketing channels, and in their excitement to do something new, can overlook methods with proven success rates like direct mail. The creative world has a similar issue, where bold colors, splashy charts, excessive highlighting and heavy use of pictures are used in hopes of gaining a reader’s attention. So it might be a surprise to learn that my best tip for making direct mail designs more successful is to simplify. While a bright graphic or unique shape might catch a reader’s attention, it will also distract him or her from the true purpose of the mailing: to inform a prospect or customer and elicit a response. The benefits must be easy to find to tempt the prospect and motivate them. The call to action (CTA) must be clearly emphasized so the conversation between prospect and seller can continue. Graphics and colors are meant to further highlight these elements, not distract from them. The offer is placed in a location where it is clear and prominent. The copy is tight to focus almost exclusively on customer benefits. The CTA is big, bold and can be found in more than one place. By meeting these criteria, it’s easier to create a design that complements the text and helps guide the reader’s eye to the most important messages. It also helps streamline the design and keep the distraction of SOS minimal, resulting in far less chaos. Simplicity is actually starting to become a shiny object of its own. Many verticals are trending toward package designs that remove “fluff.” Letters that consist of only a few paragraphs or less are proving to be highly effective in getting prospects to respond. The goal is to pique prospects’ interest enough that they are intrigued, but don’t have enough details to make a full purchase decision. This drives them to stores, call centers or websites where the marketer can provide a more complete overview of the product or service and complete the sale. Depending on what your CTA is, plan ahead to ensure that your website is up to date, your call centers are appropriately staffed and whatever other preparations may be needed are completed before the mailing. This will ensure the prospect is able to quickly get additional information and make a purchase. Some may worry that using minimal design and brief copy will create a mail piece that’s too vague to capture prospects’ attention. But with data, more targeted content can be developed so the offer already appeals to the individual. The result is that it doesn’t take as many words or graphics to make an impression and get people to respond. There’s an old expression, KISS: keep it simple, Stupid, and it’s true. When you take a step back and remember that you want prospects to see the message, not a flashy design, the mail piece becomes stronger. Direct mail design doesn’t need to be complicated. In fact, it shouldn’t be.